We normally do a comprehensive real estate forecast each year in November or December, outlining what we expect to see in the coming years and why we have those expectations. 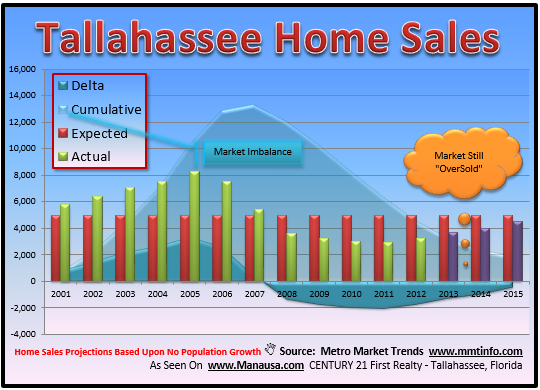 Contrary to what the National Association of REALTORs has provided, our analysis of the Tallahassee real estate market has been very accurate for the past six years. In fact, we seem to be tracking fairly close to our previously published real estate forecast for 2013. But I think it's time to take a close look at where the future of the Tallahassee housing market is going to go, and the two big variables that determine just how far and how fast that we move. It should be obvious to even the most impartial observer that the number of home sales in a region has a relationship with the number of people who live in that area. For example, we would expect New York City, NY to record more home sales than Havana, Florida each year. In order to properly conduct a real estate forecast for an area like Tallahassee, we have to monitor population changes each year to assess the long-term need for housing. If Tallahassee is growing, we will ultimately need more housing units. If Tallahassee is losing people, then the need for housing declines. 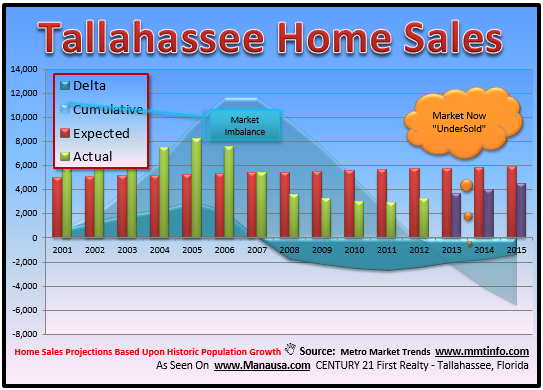 The following real estate graphs measure the imbalance between the supply and demand for homes in Tallahassee. There is a lot of information in the graph above. Ultimately, we are looking at the light blue shaded area to determine if the market is "oversold" or "undersold." In order to determine this, I have plotted (red bars) the expected number of home sales in Tallahassee each year, assuming no growth in population and no market cycles. These sales figures are consistent with what we saw sell in the 1990s, and we should expect to sell about the same number of home if we do not grow. The green bars measure the amount of homes that did actually sell (after all, there are market cycles, right?) and the purple bars are my educated guess as to what the market holds for the next three years. The resulting excess or scarcity is measured in the dark teal shaded area, with the years from 2001 through 2007 showing overselling (selling more homes than normal) while the years 2008 through 2015 showing underselling (selling fewer homes than normal). So if our population in Tallahassee records zero growth during this 15 year span, it is likely the market will still be oversold in 2015 and the recovery will need to continue with the market underselling our historical norms. But our next graph shows the same information, but our expected number of home sales have been altered to reflect our traditional population growth rate. Note how the red bars climb steadily each year, still representing no market cycles, but including growth due to a larger population. The conclusion from this graph is that our market moved to being "undersold" this year, and will continue to develop into an overly undersold market by 2015. This could represent a strong demand for new home construction and another boom in the housing market. Unfortunately, most of the population estimates that I have seen show that Tallahassee grew far slower than normal during the years from 2000 to 2010, and the past five years have been very close to zero growth. If this is true, then our market reality will be something in between the two scenarios that we reviewed above. Unless the second variable comes into play. The recovery in the real estate market has been heavily supported by historically low mortgage interest rates. And lately, there have been signs suggesting the bottom (the lowest rates) are behind us. We have written numerous articles about the impact of rising mortgage interest rates would have on our market, and we know that a large spike in rates would all but stop the wonderful housing market recovery that we have been experiencing this year. Rising interest rates are a bigger threat to people who want to sell a home than are the concerns for depreciation due to over-supply in higher price ranges. If you have (or will have) a mortgage on your home, you need to move now. If you have been thinking about moving up to a larger home, but hate the amount you'll get for your current home, then you need to "get over it" and make the move. The "loss" you take today will pale in comparison to the "gain" you will realize on the new home that you purchase. This is absolutely the best move-up market you will see moving forward. 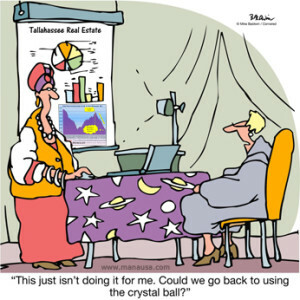 If you want help analyzing your home value and how the real estate forecast impacts your plans, just drop me a note and we'll schedule a time to help you right away.